Mighty Badge™ Starter Kit There are 4 products. The Mighty Badge™ Starter Kit is intended for use by companies with up to 10 customer/public facing personnel. Each kit consists of the means to self-produce 10 reprintable high quality, corporate style, name badges up to 8 times each, so providing for up to 80 badge issues. Further printable badge inserts can then be bought separately if required. The innovative strong magnetic fastener on each Mighty Badge™ ensures secure attachment to garments without the damage associated with older safety-pin type fasteners and the clip-together front lens construction ensures that the high quality brushed gold, brushed silver or brilliant white finish of each badge is enhanced and protected against scratching and wear. Both the silver and gold kits give the option to also print on bright white backgrounds. Please simply select the pack that suits both your preferred badge colour and printer type. If you are interested in receiving a sample, please do get in touch. only £ 0.80 per Badge Print! Produce up to 40 Brushed Gold and 40 Bright White professional quality badge prints with a standard A4 INK JET printer using supplied easy to use NamePrint® badge design software. This kit is most suitable for companies with up to 10 customer/public facing staff. 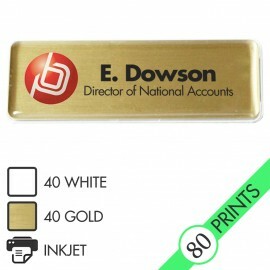 Produce up to 40 Brushed Gold and 40 Bright White professional quality badge prints with a standard A4 LASER printer using supplied easy to use NamePrint™ badge design software. Produce up to 40 Brushed Silver and 40 Bright White professional quality badge prints with a standard A4 INK JET printer using supplied easy to use NamePrint® badge design software. This pack is most suitable for companies with up to 10 customer/public facing staff. Produce up to 40 Brushed Silver and 40 Bright White professional quality badge prints with a standard A4 LASER printer using supplied easy to use NamePrint™ badge design software.